Janelle is a Vancouver based harpist. Ethereal, beautiful, ornate, intimidating — those adjectives are often employed when describing the harp. But Vancouver-via-Winnipeg harpist Janelle Nadeau proves that the harp is not only an accessible instrument but a thrillingly versatile one with her debut album,These Roads. Released in 2014, the 12-song collection serves a showpiece for the 28-year-old’s estimable classical training as well as her finely honed pop sensibility; if anyone is going to get classical harp on the radio, it’s Nadeau. She turns the ‘girl with an acoustic guitar’ trope on its ear, her shimmering strings complementing the edge in her altering voice. To be sure, Nadeau is a prairie girl at heart. She spends the summers working on her family’s grain farm in Fannystelle, Man. ; her music evokes wide-open skies and cricket songs in tall grasses. These Roads has Manitoba in its DNA; Nadeau co-wrote several of the album’s tracks with Winnipeg singer/songwriter Jaylene Johnson. She also lends her voice to a tune penned by Juno-award winning singer/songwriter Ruth Moody (the Wailin’ Jennys) as well as a song co-written by the acclaimed Alana Levandoski and Johnson. Nadeau, who plays the Celtic and electric harp, graduated from the prestigious Harp Performance Program at the University of British Columbia in 2008. 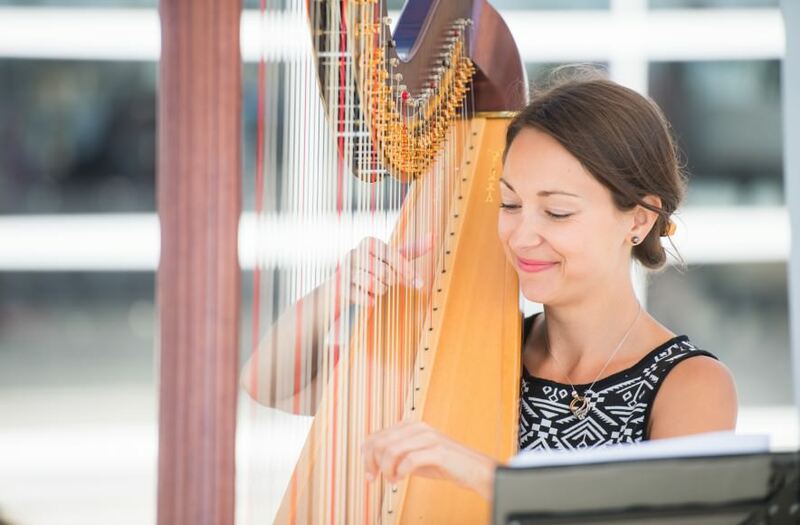 She has spent the better half of a decade touring across Western Canada with the acclaimed Celtic, medieval, and classical music group Winter Harp. She’s performed with Vancouver Opera and Vancouver Symphony Orchestra — even backing Kanye West during a Vancouver performance. From big soft-seater concert halls to palliative care homes, Nadeau’s stirring music has captured the hearts of many. Her work with Health Arts Society — which recognizes the healing power of music — is a particular point of pride; she’s performed 200 concerts in care homes and hospitals. And, with These Roads, Nadeau is poised to reach even more ears — and open more minds about what the harp can be. Ethereal, beautiful, ornate, intimidating, yes — but also incredibly powerful.